“State and local policy matters . . . can have a powerful influence in advancing or slowing educational progress,” US Secretary of Education Arne Duncan said. The impressive showing on the Trends in International Math and ­Science Study, more commonly known as TIMSS, bodes well for Massachusetts as it tries to build a larger and more sophisticated workforce in the sciences and emerging technologies. The goal is to enable the state to compete more aggressively on the global stage to attract businesses. “We’ve known for quite a while that the best education in the [United States] has been happening in Massachusetts, but the TIMSS results show that our students are getting some of the best education in the world,” said Mitchell Chester, the state’s commissioner for elementary and secondary education. Last year, about 600,000 fourth- and eighth-graders took the exam, which has been given every four years since 1995. Some sections of a country, such as Massachusetts, participated in the exam on their own. Massachusetts not only outperformed the United States as a whole, but also all of the other states that took part as independent entities: Minnesota, North Carolina, Indiana, Colorado, Connecticut, Florida, ­California, and Alabama. The exam, considered the largest assessment of inter­national student performance in math and science, was developed by the International Association for the Evaluation of ­Educational Achievement in Amsterdam and is overseen by the TIMSS & PIRLS Inter­national Study Center at the Lynch School of Education at Boston College. Eighth-graders in Massachusetts have been taking the TIMSS on and off since 1999, and their scores have been climbing. The state performed strongly in 2007 as well, most notably with fourth-graders scoring second to Singapore in science. In science, eighth-graders earned an average of 567 points last year, 11 points higher than in 2007. Similarly in math, eighth-graders earned an average of 561 last year, up from 547 in 2007. TIMSS results are reported on a scale from 0 to 1,000. In both subjects, Massachusetts scored notably higher than the United States as a whole and saw larger score ­increases. The US scored 525 in science, up from 520 in 2007, and it scored 509 in math, up from 508 in 2007. 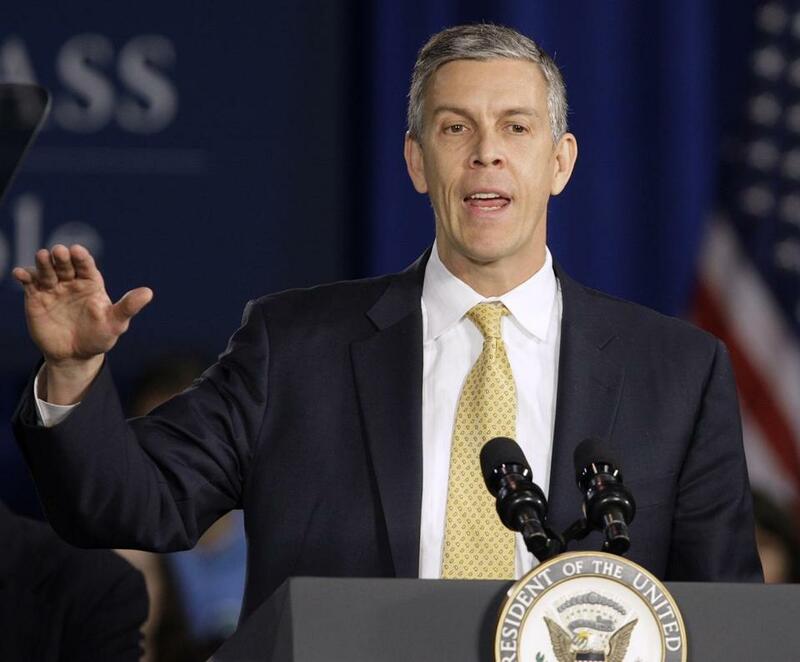 US Education Secretary Arne Duncan said the results for the United States provide some encouraging news about US students. The increases for Massachusetts demonstrates how the state continues to increase academic rigor and expectations for its students, Chester said. For instance, state officials made passing an MCAS science exam in high school a graduation requirement, starting with the class of 2010, a change that has caused even middle schools to overhaul their science programs to build a stronger foundation in the subject. 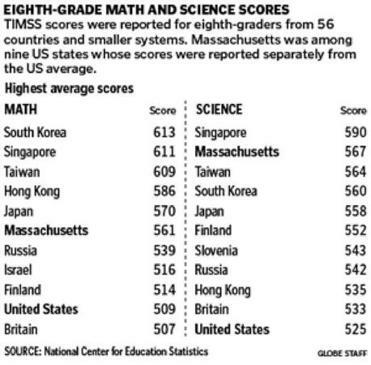 But Massachusetts still has a long way to go in science to catch up with Singapore, where scores last year on the TIMSS rise to 590, a 23-point increase. Being comparable to Singapore is “quite the achievement,” said Michael O. Martin, the ­other executive director of the center, who chalked up some of the state’s success to having a challenging curriculums in math and science. The results for Massachusetts mirror strong performance on several national ­exams, such as the SATs, in math and science. In spite of this success, surveys from the College Board, which administers the SAT, have shown that Massachusetts students are less likely to pursue careers in math and sciences than their peers nationwide. That dichotomy has prompted the state to spend millions of dollars to revamp science and math instruction so it is more relevant to students’ lives and to try to entice students into those fields through mentoring, internships, and tours of local companies. The TIMSS, which also surveys teachers and students about their educational experiences, paints a picture of a state that places a premium on high achievement and academic rigor. Massachusetts has one of the most educated teaching forces in the world: 88 percent of science teachers have completed postgraduate degrees, and 75 percent of math teachers have received those credentials, more than three times the international average and notably higher than the US average of 62 percent. Many Massachusetts students also leave school each day for homes that have among the highest percentage of educational resources: books, an Inter­net connection, and private bedrooms that can reduce distraction from study. Students here have higher expectations for themselves than their peers in most other countries. For instance, 85 percent of Massachusetts students expect to receive a university degree.